BEAUTIFUL GIFTS FROM BEAUTIFUL FRIENDS !! start here, showing the ones from friends not on FB. and after that from my dear other friends. And here a great bag, with lavender from Marie`s garden, added. And oh, her amazing collage hanger, with the feathers and the sprig with text. Isen`t it wonderful, see the little metal nest ,so cute. gift wraps ,so adorable , and stunning with the paper rose and the lovely laces. opening up all your gorgeous gifts to me, my dear friend. filled with wonderful images for me to play with. You can see the bunch here . and filled with such lovely charms , to play with. Dearest Marie, thank you again from my heart, you know how much I treasure our friendship,and your amazing gifts. A most beautiful tag on one of the packages. behind the lovely lady.- so beautiful dear friend. And a beautiful button card, so wonderfully altered, that it looks from dayes gone by!! In the little bag, was another fantastic surprice !!! every piece you have ever send me, and so happy for your friendship . feeling good, my sweet friends. In a few dayes I will show more of my so beautiful gifts from blogging friends. Till then, take care all !! A MOST BEAUTIFUL, AND LOVELY BIRTHDAYGIFT ! Last friday I recieved a package from a very dear friend Terri of Artful Affirmation! ok to open it up, for me to be comforted! the same Mother Mary image , so romantic in style, and a little shabby, too. pink ladybug, the flowers of all kind, and wonderful seam bindings. pink ribbon on top, and the pink beautiful flower. You can see it here close up!! from her heart, I know. buttons, and another cute ladybug . So delightful and a stunning piece all together. Thank you my dear Terri, your gift warmed my heart and gave me a feeling of ease. I am not to have more tests , for which I`m so grateful. telling me to feel joy and have a happy heart for the everyday`s little miracles and experiences. to see it and know you made it just for me, for which I`m also so very grateful. so I`m not complaining, as all is so very dry here. my dear readers and followers. I used many different componets, but mostly paper, paper napkins and lace. I think the woman so beautifully brings summer and joy. Also this little chap is a bringer of joy ,whenever it sings to us!! to the hospital for more tests or treatments. Thank you to new followers, you are so very welcome. WISHING YOU A LOVELY WEEKEND !! 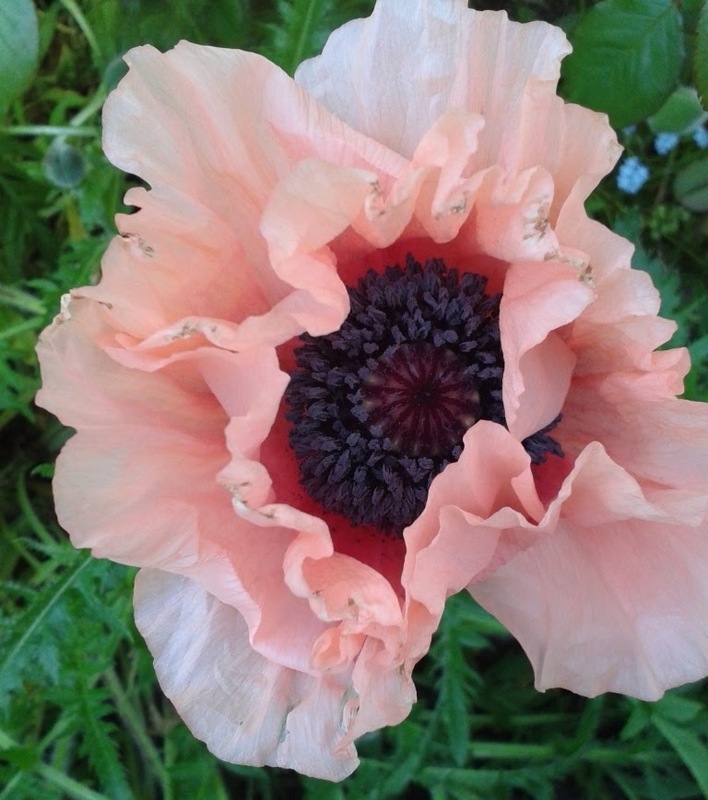 Poppy I wish you all some wonderful dayes ahead. visiting you when I`m back again tuesday ! Till then ,-take care and be well.